For the town, see Shijiazhuang, Shanxi. Shijiazhuang (Chinese: 石家庄, [ʂɻ̩̌.tɕjá.ʈʂwáŋ]) is the capital and largest city of North China's Hebei Province. Administratively a prefecture-level city, it is about 266 kilometres (165 mi) southwest of Beijing, and it administers eight districts, two county-level cities, and 12 counties. Clockwise from top: Panoramic view near Huaite Building, far view of downtown Shijiazhuang, Hebei provincial museum, Gangnan reservoir, Shijiazhuang TV Tower. As of 2015 it had a total population of 10,701,600 with 4,303,700 in the central (or metro) area comprising the seven districts and the county of Zhengding largely conurbated with the Shijiazhuang metropolitan area as urbanization continues to proliferate. Shijiazhuang's total population ranked twelfth in mainland China. Shijiazhuang experienced dramatic growth after the founding of the People's Republic of China in 1949. The population of the metropolitan area has more than quadrupled in 30 years as a result of industrialization and infrastructural developments. From 2008 to 2011, Shijiazhuang implemented a three-year plan which concluded with the reorganization of the city resulting in an increase of green areas and new buildings and roads. A train station, airport and a subway system have been opened. Shijiazhuang is situated east of the Taihang Mountains, a mountain range extending over 400 km (250 mi) from north to south with an average elevation of 1,500 to 2,000 m (4,900 to 6,600 ft), making Shijiazhuang a place for hiking, outdoor trips and cycling. The oldest name of the city was Shiyi. In pre-Han times (i.e., before 206 BC), it was the site of the city of Shiyi in the state of Zhao, and from Han (206 BC–AD 220) to Sui (581–618) times it was the site of a county town with the same name. With the reorganization of local government in the early period of the Tang dynasty (618–907), the county was abolished. Shijiazhuang then became little more than a local market town, subordinated to the flourishing city of Zhengding (modern Zhengding) a few miles to the north. The growth of Shijiazhuang into one of China's major cities began in 1905, when the Beijing–Wuhan (Hankou) railway reached the area, stimulating trade and encouraging local farmers to grow cash crops. Two years later the town became the junction for the new Shitai line, running from Shijiazhuang to Taiyuan, Shanxi. The connection transformed the town from a local collecting centre and market into a communications centre of national importance on the main route from Beijing and Tianjin to Shanxi, and later, when the railway from Taiyuan was extended to the southwest, to Shaanxi as well. The city also became the centre of an extensive road network. Pre-World War II Shijiazhuang was a large railway town as well as a commercial and collecting centre for Shanxi and regions farther west and for agricultural produce of the North China Plain, particularly grain, tobacco, and cotton. By 1935 it had far outstripped Zhengding as an economic centre. At the end of World War II the character of the city changed when it took on an administrative role as the preeminent city in western Hebei, and developed into an industrial city. Some industries, such as match manufacturing, tobacco processing, and glassmaking, had already been established before the war. On November 12, 1947, the city was captured by Communist forces. In 1948 the city, formerly known as Shímén (石門), was renamed Shijiazhuang. Xibaipo, a village about 90 km (56 mi) from downtown Shijiazhuang, in Pingshan County was the location of the Central Committee of the Communist Party of China and the headquarters of the People's Liberation Army during the decisive stages of the Chinese Civil War between May 26, 1948 and March 23, 1949, at which point they were moved to Beijing. Today, the area is a memorial site. After 1949 the industrialisation of the city gathered momentum. Its population more than tripled in the decade 1948–58. In the 1950s, the city experienced a major expansion in the textile industry, with large-scale cotton spinning, weaving, printing, and dyeing works. In addition there are plants processing local farm produce. In the 1960s it was the site of a new chemical industry, with plants producing fertilizer and caustic soda. Shijiazhuang also became an engineering base, with a tractor-accessory plant. There are important coal deposits at Jingxing and Huailu, now named Luquan, a few miles to the west in the foothills of the Taihang Mountains, which provide fuel for a thermal-generating plant supplying power to local industries. In 1967, Tianjin was again carved out of Hebei, remaining a separate entity today, and thus the provincial capital was moved to Baoding. It was chaotic in the midst of the Cultural Revolution, and under the direction of Mao Zedong, in 1968, to "prepare for war and natural disasters", Shijiazhuang became the provincial capital. Shijiazhuang is located in south-central Hebei, and is part of the Bohai Economic Rim. Its administrative area ranges in latitude from 37° 27' to 38° 47' N, and the longitude 113° 30' to 115° 20' E. The prefecture-level city reaches a 148 kilometres (92 mi) north-south extent and a 175 kilometres (109 mi) wide from east to west. The prefecture has borders stretching 760 kilometres (472 mi) long and covers an area of 15,722 square kilometres (6,070 sq mi). 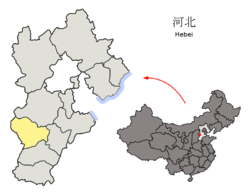 Bordering prefecture-level cities in Hebei are Hengshui (E), Xingtai (S), and Baoding (N/NE). To the west lies the province of Shanxi. The city stands at the edge of the North China Plain, which rises to the Taihang Mountains to the west of the city, and lies south of the Hutuo River (Chinese: 滹沱河; pinyin: Hūtuó hé). From west to east, the topography can be summarised as moderately high mountains, then low-lying mountains, hills, basin, and finally plains. Out of the eight east–west routes across the Taihang Mountains, the fifth, the Niangzi Pass, connects the city directly with Taiyuan, Shanxi. The city has a continental, monsoon-influenced semi-arid climate (Köppen BSk), characterised by hot, humid summers due to the East Asian monsoon, and generally cold, windy, very dry winters that reflect the influence of the Siberian anticyclone. Spring can see sandstorms blowing in from the Mongolian steppe, accompanied by rapidly warming, but generally dry, conditions. Autumn is similar to spring in temperature and lack of rainfall. January averages −2.3 °C (27.9 °F), while July averages 26.8 °C (80.2 °F); the annual mean is 13.38 °C (56.1 °F). With the monthly percent possible sunshine ranging from 45 percent in July to 61 percent in May, the city receives 2,427 hours of sunshine annually. More than half of the annual rainfall occurs in July and August alone. In 2014, the GDP of Shijiazhuang reached CNY(RMB) ￥510.02 billion (about $80.45 billion in USD), an increase of 12 percent over the previous year. Shijiazhuang has become a major industrial city in North China and is considered to be the economic center of Hebei province. The city is a major base for the pharmaceutical and textile industries. Other sectors include machinery and chemicals, building materials, light industry and electronics. With abundant agricultural resources, Shijiazhuang has 590,000 hectares of cultivated land and is the main source of cotton, pears, dates and walnuts in Hebei province. In 2008, total imports reached US$1.393 billion, an increase of 42.1 percent over the previous year. Exports increased by 34.9 percent to US$5.596 billion. 2006 World Bank reported that Shijiazhuang was spending less than RMB400 per capita on education, as opposed to Beijing (RMB1,044) and Weihai (RMB1,631). The zone was established in March 1991 as a state-level development zone and is divided into three districts. National highways 107, 207, 307, 308 pass through the zone. It is 15 km (9.3 mi) away from Shijiazhuang Railway Station, 105 km (65 mi) away from Tianjin Port. Industries include pharmaceuticals, electronic information, mechanical production, automobile manufacturing, chemicals production and logistics. The Eastern District, located in the eastern part of Shijiazhuang, covers an area of 5.8 km2 (2.2 sq mi), and serves as the primary section of the New High-tech Industrial Development Zone. The district focuses on the establishment of new high-tech enterprises. There are plans to expand the district into an area of 9.8 km2 (3.8 sq mi). A railway line operated by Shijiazhuang Oil Refinery runs through the zone from north to south, so enterprises in the zone can build lines of their own. The Western District, located in the southwest of Shijiazhuang, covers an area of 8.2 km2 (3.2 sq mi). It focuses on small- and medium-sized technology enterprises and technology incubation. Liangcun District, which borders the Western District, covers 4 km2 (1.5 sq mi), and focuses on the pharmaceutical industry and the petrochemical industry. By 2009, some 2,600 enterprises had settled in the zone, of which 185 were foreign-funded enterprises. Firms from Japan, the US, the Republic of Korea, Germany, Italy, Canada, Malaysia, Hong Kong, Macao and Taiwan had established themselves in the zone. The city is a centre for the dairy trade, being the headquarters of the Sanlu Group. Sanlu became Shijiazhuang's largest taxpayer since it had become the largest formula seller in China for a continuous 15-year period. Richard McGregor, author of The Party: The Secret World of China's Communist Rulers, said that Sanlu became "an invaluable asset for a city otherwise struggling to attract industry and investment on a par with China's premier metropolises." Both the dairy trade and Sanlu were affected by the 2008 Chinese milk scandal. The chairman and general manager of Sanlu, and several party officials, including the vice-mayor in charge of food and agriculture, Zhang Fawang, were reportedly removed from office. Mayor Ji Chuntang reportedly resigned on 17 September. Shijiazhuang is a transportation hub at the intersection point of the Beijing–Guangzhou, Taiyuan–Dezhou, and Shuozhou–Huanghua railroads. The new Shijiazhuang Railway Station (opened December 2012) has a rare distinction of being served by both the "conventional" Beijing–Guangzhou Railway and the new Beijing–Guangzhou–Shenzhen–Hong Kong High-Speed Railway. Such an arrangement is fairly uncommon on China's high-speed rail network, as typically high-speed lines are constructed to bypass city cores, where the older "conventional" train stations are. In Shijiazhuang's case, to make it possible to bring the new high-speed railway into the central city, a 5 km (3.1 mi) long railway tunnel was constructed under the city. This is the first time a high-speed railway has been run under a Chinese city. There is also a smaller Shijiazhuang North Railway Station, used by trains going west toward Taiyuan without entering Shijiazhuang's city centre. The city is served by many expressways, including the Shitai, Beijing–Shenzhen and Taiyuan–Cangzhou Expressways. Line 1 and Line 3 of the Shijiazhuang Metro began operation on June 26, 2017. Line 1 Phase 2, Line 2 Phase 1, Line 3 Phase 2 and the remaining two ends of Line 3 Phase 1 are currently under construction. Line 1 Phase 2, Line 2 Phase 1, and the two ends of Line 3 Phase 1 will start operation in 2020. There will be three metro lines extending 80.4 km (50.0 mi)under operation in Shijiazhuang by 2021 when Line 3 Phase 2 completes. The latest metro plan of Shijiazhuang includes 6 lines in total. The railway company is drafting a new plan of 1,000 km (620 mi)urban rail transit system incorporating metro, urban rapid commuter rail and tramways, and expects there will be 200 km (120 mi)rail transit lines under operation or construction by the end of 13th Five Year Plan (2020). The Shijiazhuang Zhengding International Airport is the province’s center of air transportation. It is about 30 kilometers northeast of the city. There are 32 domestic routes arriving at and departing from Shijiazhuang, including destinations such as Shanghai, Shenzhen and Dalian. The airport serves 12 international destinations including four routes to Russia. The airport is being expanded and will be capable of being an alternate airport to Beijing Capital International Airport. With the opening of the Beijing–Guangzhou High-Speed Railway at the end of 2012, the airport got its own train station, making available fast, although infrequent, train service between the airport and Shijiazhuang Railway Station, as well as other stations in the region. Most large roads in the city feature a separate cycle lane and, combined with the city being flat, make it ideal for cycling. Thousands of cyclists use the city each day and often there are more cyclists waiting at a crossroad than cars. Shijiazhuang is headquarters of the 27th Group Army of the People's Liberation Army, one of the three group armies that comprise the Beijing Military Region responsible for defending China's capital. The city of Shijiazhuang is similar to Beijing in that all roads run from north to south and east to west, making the city easy to navigate. Many roads have cycle paths making it cyclist friendly. In the heart of the city is the Hebei Museum (Chinese: 河北博物馆;; pinyin: Héběi Bówùguǎn) which was refurbished in 2013 and 2014. It holds regular events, mostly showing traditional Chinese art and artifacts. The Yutong International Sports Centre hosts the Shijiazhuang Ever Bright football matches as well as holding pop concerts. Shijiazhuang Zoo is located on the west side of the city. The zoo has 3,000 animals of 250 species including flamingos, golden monkeys, manchurian tigers, Indian elephants, giraffes, chimpanzees, kangaroos, seals, white tigers, springboks and pandas. Near the Shijiazhuang Zoo are the Botanical Gardens (Chinese: 石家庄植物园), offering a range of exotic and native plants both to view and purchase.The Martyrs Memorial (Chinese: 烈士纪念馆) can be found in the centre of the city, commemorating the soldiers lost in war. Nantianmen (南天门), the main entrance to Baodu Zhai. Baodu Zhai (Chinese: 抱犊寨; pinyin: Bàodúzhài), or Baodu Village, is an ancient fortified hilltop settlement located on the west side of the city, the mountain contains walks and buddhist statues. Close to Baodu Zhai is Fenglong Mountain (Chinese: 封龙山) is situated 5 km (3.1 mi) outside of Shijiazhuang to the west, the mountain features walks and a large stone Buddha statue situated on top of the mountain. Mount Cangyan (Chinese: 苍岩山; pinyin: Cāngyán Shān; literally: 'Green Cliff Mountain') is a scenic area in Jingxing County, famous for its combination of natural mountain scenery with historical man-made structures. It was featured in a scene of the Chinese movie Crouching Tiger, Hidden Dragon. The Longxing Temple (Chinese: 隆興寺; pinyin: Lóngxīng Sì) is an ancient Buddhist monastery located just outside the city. It has been referred to as the "First Temple south of Beijing". The Anji Bridge (also known as Zhaozhou Bridge) (simplified Chinese: 安济桥; traditional Chinese: 安濟橋; pinyin: Ānjì Qiáo; literally: 'Safe crossing bridge') is the world's oldest open-spandrel stone segmental arch bridge. Credited to the design of a craftsman named Li Chun, the bridge was constructed in the years 595-605 during the Sui dynasty (581–618). 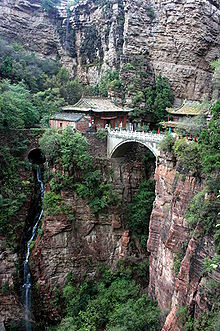 It is the oldest standing bridge in China. The Pagoda of Bailin Temple (Chinese: 从谂禅师舍利塔; pinyin: Cóngshěn Chánshī Shělìtǎ or 赵州塔; Zhàozhōu Tǎ) is an octagonal-based brick Chinese pagoda built in 1330 during the reign of Emperor Wenzong, ruler of the Mongol-led Yuan Dynasty (1271–1368). Shijiazhuang city centre contains a range of parks. The largest park is found in the centre of the city known as Chang'an Park (Chinese: 长安公园), the park includes an underground shopping mall, a theatre, a museum, a lake, bars and restaurants. Another park is found on the south east side of the city: Century Park (Chinese: 世纪公园), Century Park contains a lake in the centre with an amusement park to the north side. On the northwest side of the city is Water Park (Chinese: 水上公园）which features a large lake, amusement rides, short walks and various restaurants. As well as these three large parks there are smaller parks scattered across the city. The largest mall in the city is the Wanda shopping mall on the southeast side of the city along with the Lerthai shopping mall in the centre of the city and Wondermall on the southwest side. The Wanda mall includes an IMAX theatre. During the summer barbecue restaurants (Chinese: 烧烤) open, selling a whole range of foods, the most popular of which are lamb kebabs (Chinese: 羊肉串). Thousands of restaurants can be found across the city offering a range of Chinese as well as western cuisine open around the clock. Shijiazhuang Ever Bright F.C. (simplified Chinese: 石家庄永昌;; traditional Chinese: 石家莊永昌;; pinyin: Shíjiāzhuāng Yǒngchāng) is a Chinese football club based in Shijiazhuang, Hebei, which competes in the Chinese Super League. It plays in the 37,000-seat Yutong International Sports Centre. The team changed to their current name on February 24, 2014 . Yutong International Sports Center (Chinese: 裕彤国际体育中心) is a multi-use stadium, used mostly for football matches. The capacity is 38,500. ^ "Illuminating China's Provinces, Municipalities and Autonomous Regions". PRC Central Government Official Website. Retrieved 2014-05-17. ^ "Distance from Beijing to Shijiazhuang". DistanceFromTo. Retrieved 2018-05-12. ^ 最新中国城市人口数量排名(根据2010年第六次人口普查) (in Chinese). www.elivecity.cn. 2012. Retrieved 2014-05-28. ^ 中国地面国际交换站气候标准值月值数据集（1971－2000年） (in Chinese). China Meteorological Administration. Archived from the original on 2013-03-18. Retrieved 2015-01-15. ^ 河北：石家庄市2011年GDP同比增长12.0%. www.chinacc.com (in Chinese). Retrieved 2 June 2015. ^ a b c "China Expat city Guide". China Expat. 2009. Retrieved 2009-02-08. ^ "RightSite.asia - Shijiazhuang High-Tech Industrial Development Zone". rightsite.asia. ^ McGregor, Richard (2012). The Party: The Secret World of China's Communist Rulers. New York: Harper Perennial. p. 182. ISBN 978-0-06-170876-3. ^ Yanzhao Evening News. 规划1000公里轨道交通线 建设轨道上的石家庄. Xinhua Net. Retrieved 8 November 2017. ^ 骏豪撤资石家庄永昌用新名 保加利亚国脚前腰加盟 (in Chinese). sports.sina.com.cn. 2013-12-27. Retrieved 2015-06-12. ^ "China Expat city Guide". China Expat. 2009. Retrieved 2009-02-08. ^ "the third hospital of hebei medical university". dun&bradstreet. Archived from the original on 23 July 2015. Retrieved 23 July 2015. Wikimedia Commons has media related to Shijiazhuang. Wikivoyage has a travel guide for Shijiazhuang.